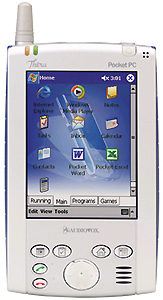 The Audiovox Thera is essentially a Windows CE-based PDA with a Sierra Wireless CDMA data card/phone grafted onto it. No effort was made to physically modify the PDA to make it work as a phone per se, and you can only talk with people using the built-in speakerphone or with an earbud/headset. The real advantage to having a phone in a PDA is to provide an always-on connection to the Internet, thus making your device a Connected PDA. Because I’m not in the business of reviewing PDAs I won’t say much concerning the non-phone aspects of the Thera. My only concern is the phone functionality, and how well that works compared to other CDMA phones on the market. However, the Thera isn’t like a regular phone, in that those interested in buying such a device are doing so because they want a Windows CE PDA that has a wireless connection to the Internet, and not because they think it’s a cool phone. In other words, phone functionality is probably of secondary concern to the Thera target market. At this time the only Canadian provider selling the Thera is Bell Mobility. The device itself is a couple of years old now, and from the standpoint of buying the Thera as a PDA primarily, the age could be a sticking point for many buyers. The color screen certainly demonstrates the age of the device, as it is horrible compared to screens on most color phones these days. The colors are totally washed-out, and the backlight isn’t bright enough. Phone functionality is provided by a phone applet that runs like any other applet in the device. Numbers are dialed using a virtual on-screen keypad, which CAN be operated by using your fingers, but I found the accuracy of that approach to be rather poor. Expect to use the stylus to make phone calls. Fortunately it does have dedicated TALK and END buttons below the screen. Pressing the green talk button automatically launches the phone applet, and can be used to redial the last dialed number. The phonebook capabilities of the Thera are quite good, but I didn’t find it quite as intuitive as I’d been expecting. That aside, the phonebook provides plenty of secondary information, and it is at least as powerful as the best phonebooks I’ve seen on any phone-specific devices that I’ve tested. Ringtones are provided through the built-in speaker, and while they are sufficiently loud for most circumstances, it lacks the solid volume needed to hear the phone ringing in noisy environments, especially if the phone is inside its carrying case and stuffed into your pants pocket. RF performance also shows the age of the phone. In back-to-back tests with my old Motorola ST-7868W the Thera manages to tie it for RF sensitivity and overall stability. If it had been 2 years ago that would have qualified the Thera for an excellent rating, but with newer CDMA phones such as the Kyocera Blade blowing the ST-7868W out of the water, it’s not so great anymore. Audio quality isn’t all that great, but it is certainly acceptable for a phone that is likely to be used a lot less than a dedicated device would (though it depends upon the user). The speakerphone is loud enough to use in a moderately noisy environment, though the overall quality of the sound is low. There were far too many sympathetic vibrations in the housing unless the volume was turned down low. The Thera comes with a Plantronics earbud, but the overall quality of this earbud is disappointing. Compared to my Samsung earbud, the Plantronics unit was tinny and scratchy-sounding. Oddly enough, it seemed to sound exactly like the speakerphone on the Thera. Outgoing sound quality on the speakerphone was acceptable, and it wasn’t bad with the earbud. I personally found using the Thera as a phone was a pain in the neck, but I’m not really a PDA type, and so I don’t readily accept the compromises that combining these two devices imposes. Sadly I have nothing else to which to compare the Thera, as I haven’t tested any other such devices. The closest that I’ve come is with the Ericsson P800 and P900, which are really phones with PDA functionality, rather than PDAs with phone functionality. It is therefore like comparing apples and oranges. As I noted at the beginning of this review, the target market for a device such as the Thera is very different from the target market for a device that is primarily a phone. If your basic need is for a connected palm device with Windows CE and yet is capable placing and receiving calls, then I can’t really image that you’d be very disappointed with the Thera. Bell Mobility’s 1xRTT data services works very well in my experience, and that should keep the PDA lovers happy with the Thera.